Kerry Peterson’s haiku – composed while a first year student in the University of Minnesota-Rochester campus’ innovative, interdisciplinary Center for Learning Innovation’s Bachelor of Health Sciences program – is something I know about because one of the teachers involved in this integrative assignment – Yuko Taniguchi -worked with me as a TA ten years ago for Twin Cities campus large enrollment section of Introduction to American Literature. I am constantly seeking and exploring new and creative ways to establish a respectful and tolerant learning environment for students. integrate chemistry and creative writing. By working with the characteristics of Haiku structure, the goal of this project was not only to deliver informative factual details of an element, but also to discover an original and fresh perspective of the same element. Students were challenged to portray a sense of focus, story, progress, and completeness within the 5-7-5 syllable structure. The project created sufficient excitement at UMR that Chancellor Lehmkuhle and some members of the faculty and staff (and in one case, the spouse of a faculty member) also decided to participate in the project. What you see here is the first iteration of the “Periodic Table of Haiku” project at UMR. I’ve been especially thankful to continue see Yuko as a teacher while working to discover ways teachers in the disciplines can leverage the skills and interests of their multidisciplinary students, the possibilities for integrative learning offered by assignments calling for use of skills from multiple disciplines, and select web-based platforms to engaged, enhance and extend student learning. I especially want to thank Yuko and Ranjeev for modeling ways to invite science, social science and humanities to impact one another to create a learning environment in which more learning for more students can flourish. While one of my students from ten years ago prompts one part of this Thank a Student posts this second thank you is a Thank a Bunch of Students, the 24 currently enrolled in a section of Teaching in Higher Education, where I am piloting a new course design. These students have heartily engaged the new classroom (an active learning, technology-friendly setting) a new format, and a host of new assignments. I’ve long been a practitioner and advocate of writing to learn for the ways the regular use of informal writing actually illustrates for students how, what and that they are learning; as a longtime teacher of traditional rhetoric courses across disciplines, I build speaking to learn and presenting to learn assignments into most courses. This semester, I’ve added drawing to learn as part of the new assignment package. II. Graduate students drawing. Yup. And not the diagrams, charts, tables, life sketches of qualitative, quantitative, or mixed-methods research journals and write ups. Observational drawing – to sharpen perception and make rapid and accurate records of key data in almost any situation. Conceptual drawing and diagramming – helps students visualise ideas and processes, compare their understanding and develop critical thinking skills; reinforces memory. Collaborative drawing and image making activities – can develop communication skills, encourage reflection on experience, professional and personal development planning. And here’s where I turn to work of Nick Petkovich (chemistry) as one representation of the 24 current Teaching in Higher Education students who’ve taken to drawing to learn. a Drawing/Diagram/Photograph/Chart that shows how you are now seeing, naming, defining and reconsidering learning, and be ready to talk about how you envision learning happening in classes you will teach. You may use paper and pencil, art supplies, a camera, a presentation software program of some sort to generate a collage, an image, a slide, an artifact, or some combination of these. – on our Class 2 discussion? A clear, illustrative, practical and conceptual respectful and probing cross-disciplinary conversation about learning – in light of theories read, presented, discussed; in light of socially constructions involving personal, cultural, disciplinary and institutional contexts; in light of newly begun conversations about designing class sessions that made learning more transparent/less oblique as process, practice and product. What’s became clearer at mid-semester? The writing course outcomes – which we call “student learning outcomes” – stopped being pro forma, something done to meet syllabus guideline requirements, and became deliberately composed cognitive, affective, kinesthetic outcomes that were linked to specific, structured assignments with aligned assessments, and that were anchored to student preparation for class sessions involving students in the development of their learning. Teaching ideas were cued by learning goals and needs and tasks. I’ve used versions of this assignment in teaching first year and advanced courses in Women’s Studies, English, American Studies, Rhetoric, Sexuality Studies and creative non-fiction writing. As in the Teaching in Higher Education course this semester, it prompts in these undergraduate courses definitions, discussions, and developments related to learning. Wish I’d begun much earlier to ask Future Faculty to do this activity – and to consider how to introduce the idea and practice of learning to their students. define and explain, in their own words, the basic components of the immune system in order to evaluate how the immune system works. explain how the components of the immune system interact with and impact one another leading to an effective immune system. demonstrating the relationships linking the immune components discussed in the previous class. This exercise will allow you to get a grasp on the complexity of the immune system….For example, if in classes 1 and 2 we discuss T cells and their function, I will expect the students to create a diagram that hits on the main components of T cell function. Then if in class 3 and 4, we discuss B cells, I will expect students to not only diagram the main functions of B cells but also how the function of B cells impacts the function of T cells and vice versa. Every student will also provide a short narrative providing rationale, and explanation of their diagram and why they depicted interactions/functions/relationships etc. in the manner that they did. The narrative will serve to ensure that students are not simply copying a chart from online or out of a book, but that they are actually understanding the complexity of the immune system and its interactions. 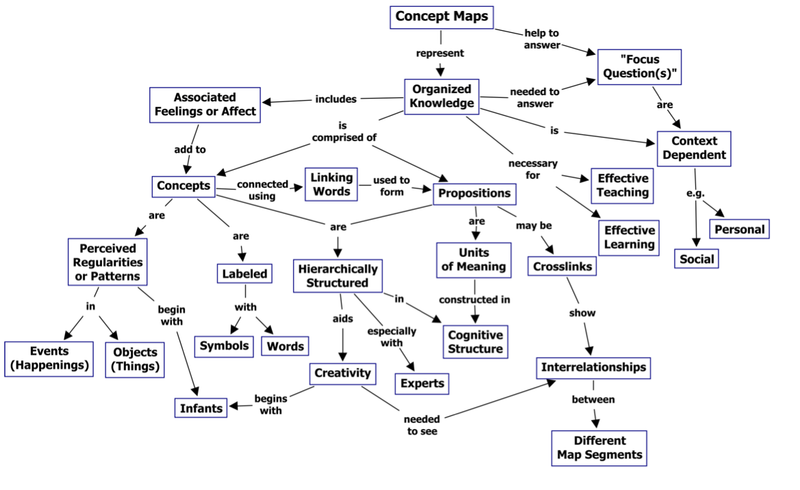 Why concept maps? How are these a means of drawing to learn? How will these prompt learning – cumulative, repurposed, restated, multiply cued over time? Concept maps – like Haiku Periodic Tables and drawing to learn diagrams about learning – are foundational and creative and evaluative learner-aware assignments that invoke the full spectrum of Bloom’s Taxonomy. 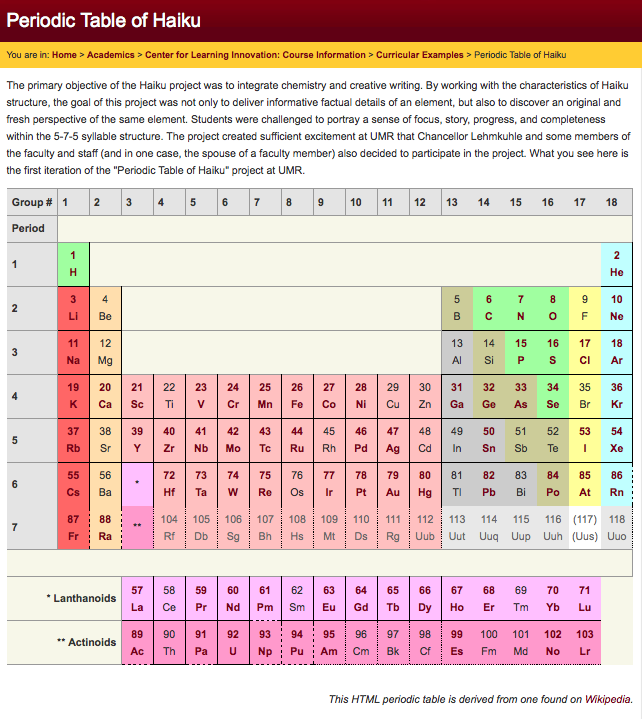 An earlier version of a Haiku Periodic Table can be found in the WayBackMachine archives at http://web.archive.org/web/20010804125023/http://www.iscifistory.com/scifaku/elements/periodichaiku.asp. For more on the Brighton project – from theory to resources to an overview of a collaborative project involving a cluster of US colleges including Harvard, MIT, Duke University and Roxbury Community College – see http://www.brighton.ac.uk/visuallearning/drawing/. For more on presentation slides and visual learning, see Derek Bruff’s slide set at http://www.slideshare.net/derekbruff/lecturing-basics. 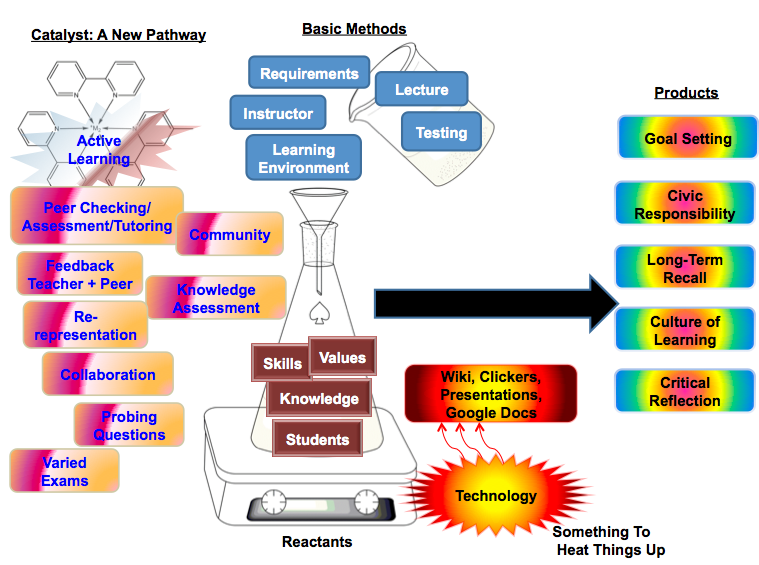 “How to Construct a Concept Map” at http://www.udel.edu/chem/white/teaching/ConceptMap.html for practical guidance. The course site from which Britnie extracted her syllabus example-illustration to accompany the assignment narrative is at http://uhaweb.hartford.edu/BUGL/immune.htm. The research article “The Theory Underlying Concept Maps and How to Construct and Use Them” at http://cmap.ihmc.us/Publications/ResearchPapers/TheoryCmaps/TheoryUnderlyingConceptMaps.htm.